Protect your eyes from the sun with polarized sunglasses from Royal Palm Optical. Polarized lenses provide some of the best glare control available. Three piece laminated or cast lenses situate a polarized film at 180 degrees to filter out all blinding bright light in the horizontal meridian. Fishermen have used polarized glasses for years to see though the glare on top of water to navigate through the shallows and find fish. This same type of glare is present while driving a car. Glare on windshields and contrast washout can lead to seriously dangerous driving conditions. 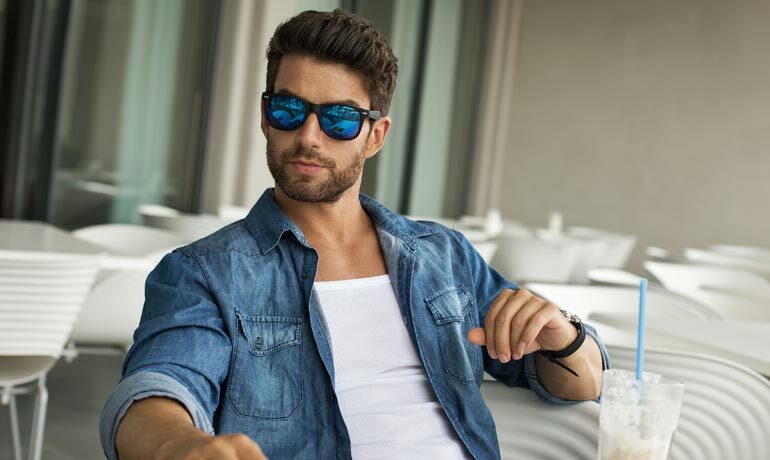 Perfect for the person on the go, Royal Palm Optical’s polarized sunglasses selection is both fashionable and functional. Polarized lenses are traditionally solid gray or brown in color, but we do also offer amber, blue and yellow colors with more limited style options. Stop into Royal Palm Optical for your free polarized lens demonstration today. 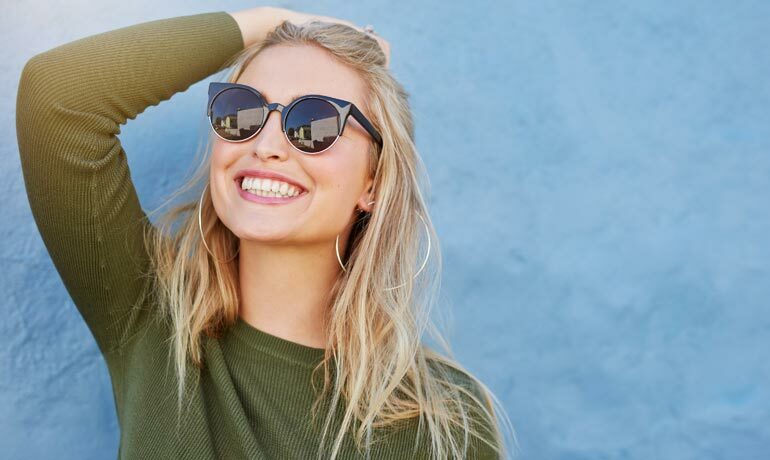 Transitions lenses are ideal for everyday eyewear because they offer all the benefits of clear lenses with the added bonus of light adjusting properties. Transitions offer comfort and convenience with automatic ultraviolet radiation (UV) protection and glare reduction. It’s like having two pairs of glasses in one. Transitions lenses are the single most convenient way to protect your eyes and have healthy sight. Transitions lenses are photochromic lenses that are clear until dangerous UV rays are present. The brighter the sun, the darker the lenses become. Transitions lenses block 100% of the sun’s harmful rays whenever invisible UV rays or visible glare are present, including cloudy days, rainy days, sunny days and everything in between. Regardless of whether or not the glare is distracting you, transitions users can be sure their eyes are protected. Eyecare professionals agree with scientific evidence that exposure to ultraviolet (UV) rays over time is harmful to the eyes. Yet research shows that only 9% of people associate ultraviolet (UV) radiation with damage to their eyes, compared to 82% who recognize the dangers of UV radiation to their skin. Transitions Optical, Inc. has developed the world’s most advanced photochromic lens technology. 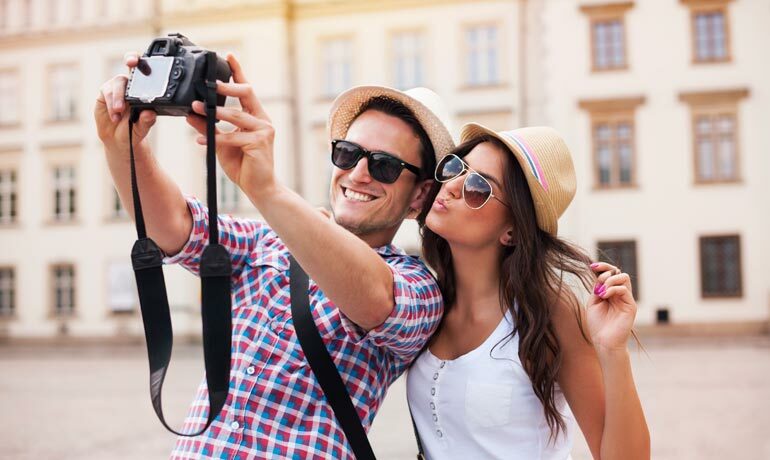 Transitions lenses are the #1 brand of photochromic lenses recommended by eyecare professionals worldwide. “Photochromic” means that the lenses automatically change from clear to dark in the presence of ultraviolet (UV) radiation. Visit Royal Palm Optical to learn more about Transitions lenses—the ideal choice for everyday glasses. Experience the visual quality and comfort as well as the convenient protection that comes with the high performance features of Transitions. Crizal lenses lead the market in producing glare reduction and anti-reflective coatings. After taking the time to choose the perfect frames, shouldn’t you also choose the best lenses for them? Advanced Crizal™ lenses let you do just that. Royal Palm Optical carries new Varilux S Series lenses. Varilux uses digital technology that is revolutionizing the optical industry. We use specialized equipment in our dispensary to take specific measurements of you, and Varilux will customize lenses to optimize your visual field. Varilux lenses provide better overall visuals than traditional bifocals. The specialty progressive lenses are ideal for people who have presbyopia, including current bifocal and trifocal wearers, people using over the counter readers and others who are unhappy with their current prescriptions. Experience sharper visuals and better clarity when you choose Varilux. Call or visit Royal Palm Optical to learn more. First time at Royal Palm Optical? Get 20% OFF your first pair of eyeglasses. Cannot be combined with any other offer or insurance.